And the play was good! Posted on December 18, 2009 by Dramabee Kids! So good! There was so much for the kids to remember, so many risks that I was asking them to take….I really stretched them to capacity – but they did it – and I was seriously impressed.Not that everything went exactly to plan, somehow the rain music seemed so much longer than it had been before, so I was directing an improvisation from the wings which covered the last minute of the piece. And the Santa poem got all jumbled up, but the kids resolved it and got through it right in front of the audience – the mistakes these kids make are so endearing, just makes me like them even more! The snowman building and snowball fight were really fun, and their stories were so cute. The audience loved it and parents signed their kids up for the next session. Good stuff. 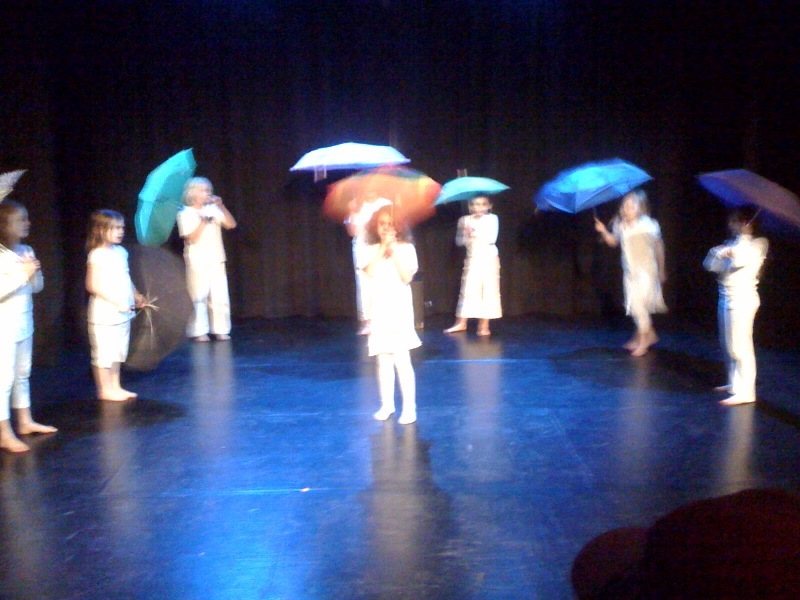 This picture is of the rain dance – a superb, uplifting, flamenco style shin-dig! Posted on December 16, 2009 by Dramabee Kids! 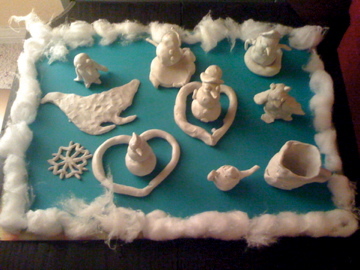 I’m so excited about this Thursday’s show – ‘A Winter Play!’. The process of working with this extraordinary group of 8 and 9 year olds has been fantastic….and now the time has come to reveal the outcome of 12 weeks of drama workshops in our show! It’s a collaboration of music, poems and stories that the children have told – an original piece of work that I am very proud to have been fortunate enough to co-ordinate. The last shows by my students have been total sell-outs – I’m hoping that the same goes for this one – it creates such an upbeat dynamic atmosphere! Posted on December 15, 2009 by Dramabee Kids! 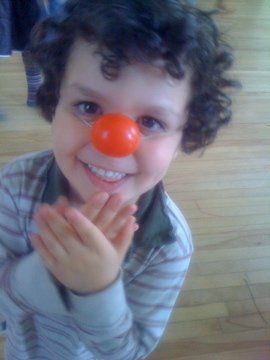 DRAMABEE ……………….. ……………acting workshops for kids! PERFORMANCE WORKSHOPS ~ During these workshops a creative process is established in which the children are encouraged to express themselves through storytelling, improvisation, and creative movement. The older group works towards a production which will include real life stories and choreographies while the younger group adapts a well known story. IMPROV WORKSHOPS ~ These workshops provide a no pressure, confidence-building environment where children have the freedom to explore many different roles. They work on character development using props and costumes and also explore acting skills such as voice work, improvisation methods and relaxation techniques. The older children will have the opportunity to work on public speaking and monologues or poem recital whereas the younger ones will focus on the fantasy aspect of drama work. DRAMABEE lead teacher and creator, Catherine Allison has been acting professionally for 20 years. She studied classical acting at Dartington College of Arts, England and then went on to take advanced classes in physical theatre in Paris, France with the legendary teacher Jacques Lecoq with whom she specialized in mask and clown work. She toured internationally in ensemble productions, performing in some of the greatest theatres in the world. Since becoming a mother, Catherine has turned her attention to working with children and has found that her unique, nurturing approach which harnesses their innate creativity and allows them to trust their instincts brings out the very best in them. It has been said by many parents that working with Catherine makes children feel stronger and more confident. Recent workshop productions include ‘Where the Wild Things Are’ and ‘The Gruffalo’. Her own clown character ‘Madame Chocolat’ – a quirky French chef, performs at parties and festivals was recently awarded Winner of the 2009 Nickelodeon Parent Picks Awards for Best Children’s Entertainer. Contact Catherine @ 310.428.7308 or catherine@madamechocolate.com for more details!